After the tour, we suited up with skates, knee pads elbow pads, gloves and helmets and hit the beautiful ice at Staples Center for a skating/ stick handling clinic lead by Daryl Evans. This is where we worked up a sweat, skating ice lengths; practicing crossovers, getting to know the inside edges, outside edges, balance, stopping, stick handling, keeping our heads up, passing, passing, shooting, scoring and passing again. Such a great lesson I don’t think anyone wanted it to end. Even Bailey, the Kings mascot with an attitude got in on the action! Daryl Evans has been teaching hockey clinics for thirty years and each and every one of us benefited from his experience and his finely tuned teaching techniques. Gotta love Staples Center! H&HH Event planner and hockey Goddess, Hilary Hodding of the Kings Fan Development Department, fresh off the ice herself, took over tour duties, taking us to a variety of special lounges (including the cigar room), restaurants, club sections, and the City View Outdoor Terrace. 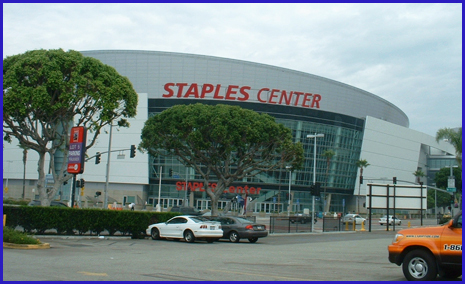 We oohed and ahhed over the views both inside and outside Staples Center. This is a well laid out and classy venue for the coolest game on earth. Personally I hope to catch more hockey here in the future. The high quality sandwiches were very well received by the women after working up an appetite on the ice. I had an opportunity to speak to the group before Daryl Evans took over and got into some series Los Angeles Kings hockey talk. Many of the women were long time fans and several offered up some great observations and questions about where the team is headed this season. Daryl also commented on the skating clinic and was quite pleased to teach women because when it comes to learning how to play the game, women are focused and eager to learn. Then Luc Robitaille joined the group and spoke about the great things that are happening with the Los Angeles Kings. Robitaille also offered plenty of insight into today’s NHL game, today’s players, answered questions from the audience and even cracked a few jokes. A relaxed, good natured, Luc posed for pictures after his speech before heading off to his duties as President of Business Operations. We had fantastic seats on the 200 Level right behind the goal, in the end the Kings attack for periods one and three. We were looking for a win so the Kings could add another one to their 3 game win streak. I wore my Oiler Killer platform shoes (The Oil are 0-5 when I’ve worn them at their games in Vancouver). The Kings won 4-1, and I’m sure the shoes had nothing to do with it! I made some awesome new hockey friends in Los Angeles, and as usual, it was tough for me to leave. Hopefully on my next trip to LA, I can meet up with you, and we can all go for a skate together at the Toyota Sports Center and then catch a Kings game. Many thanks to the Kings’ Hilary Hodding...you are a Fan Development Hockey Goddess. Your hard work and input into organizing the event made it fun and a huge success! Daryl Evans, In just over an hour, your clinic turned many of the female fans who had never tried hockey before into female hockey players who want to continue and sign up for instruction and teams. I can’t think of a better testimonial than that! Kudos to James Cefaly, Los Angeles Kings Director of Fan Development. 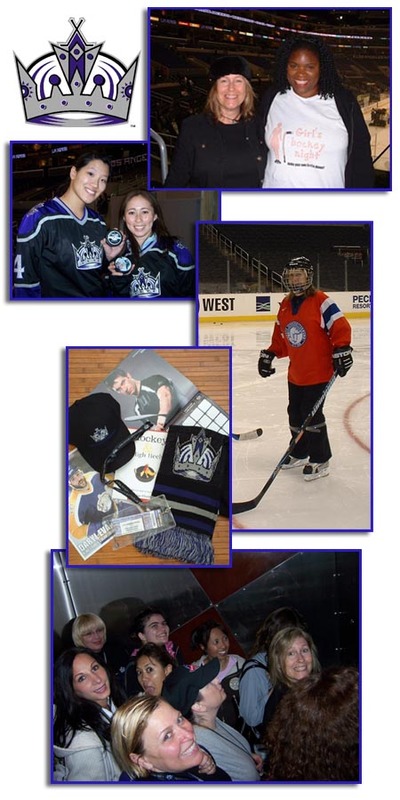 You and your hard working, hockey loving staff are “Kings” when it comes to getting people into hockey in Los Angeles! 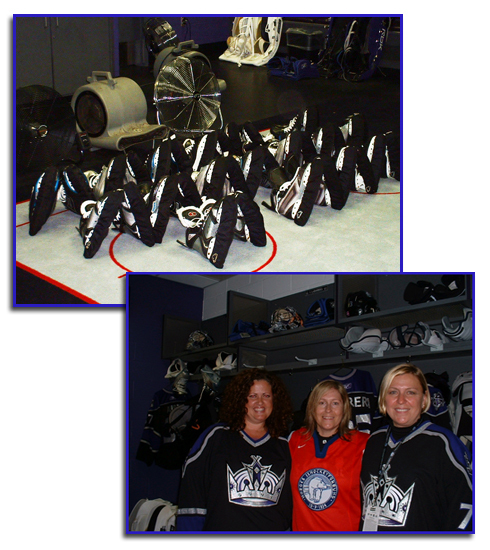 To visit the LA Kings website and recap of their Hockey & High Heels event, please click here.